HOW LONG are the odds facing Pete Buttigieg in his quest to become America’s 46th president? The mayor of South Bend, Indiana, launched his campaign this week. Online, British bookmakers offer gamblers the chance to bet on anything, including who will be the eventual Democratic candidate for the 2020 election. Odds are available, so far, for some 70 names, including the most fanciful such as non-politicians like Katy Perry (an extreme outside bet at 500:1), Lady Gaga (also unlikely, at 150:1), Mark Zuckerberg (100), George Clooney (50) and Oprah Winfry (25). Among actual politicians, whether declared candidates or not, the shortest odds are for Beto O’Rourke (the favourite, at 4:1), followed by Kamala Harris (7:2), Elizabeth Warren and Joe Biden (each 7:1). It is a measure of the challenges facing the mayor—who is personable, just 37, bright and energetic but little known beyond the Midwest—that bookmakers have not heard of him. Even a day after announcing his run for the presidency, hoping to be the youngest person ever to hold the highest office, no odds were published for him. Mayor Buttigieg is about to launch a political biography and tour Iowa. Yet the chances that he, or any other little-known candidate, can emerge victorious from what is sure to be a crowded Democratic field, look as slim as the man himself. Your correspondent recently spent a day in South Bend, touring the city of 100,000 people with the two-term mayor. He calls his hometown a testament to hope. Eight years ago South Bend was a prime example of a rustbelt town where the collapse of manufacturing and the loss of jobs left voters miserable and afraid. Drive around with Mr Buttigieg and he points out empty plots in residential areas where abandoned houses have been torn down. Once mighty factories—Studebaker, a car manufacturer, had its headquarters there—were abandoned. Yet the city has recovered. Nearby Notre Dame University is a big employer. New apartments are appearing in former warehouses. Startups are busy working on the Internet of Things. The city population is now stable. AM General, which plans to make electric cars, has its headquarters in town. The mayor stops off for a ceremony late in the afternoon, shovelling dirt before TV cameras, launching a project where luxury flats are to be built. Residents are clearly fond of him—in one café a popular sandwich (peanut butter and granola) carries his name. In conversation the mayor is articulate in discussing issues like climate change, gay rights, criminal-justice reform, teachers’ pay and whether the economy will need to offer people guaranteed incomes. Such issues should appeal to his fellow young voters, at least. As remarkable, considering that Indiana is a strongly Republican state with a large population of Catholic, conservative voters, the fact that Mr Buttigieg married his husband recently is entirely uncontroversial. He may be running to be the first (openly) gay president, but most voters simply shrug at the fact. The problem for the mayor is his brief biography. He does have a striking background for one so young. As a Democrat who is popular in a Republican part of the Midwest, in theory he could appeal to the sort of voters—blue collar, in industrial towns—that Hillary Clinton failed to appeal to in 2016. He warns that “we’ve lost touch” as a party and promises to make good on that, warning that politics “could get really ugly” in the next few years. As a former veteran who served in Afghanistan, mostly at the Bagram airbase near Kabul, he speaks with some authority about promoting freedom and security. And as a former management consultant at McKinsey, he knows a thing or two about business. All that could make him a strong candidate, for example, to run for governor of Indiana one day. Yet as a mayor of a smallish city, it looks hard for Mr Buttigieg to claim governing experience relevant for the presidency. In contrast Michael Bloomberg, a billionaire and former mayor of New York, can say his city is of global importance. Mrs Warren, a senator from Massachusetts, is well known for campaigning against inequality and the excesses of the finance industry. The South Bend mayor lacks a single issue by which to define himself. Nor has Mr Buttigieg yet proven himself capable of serious fundraising, in the way that Mr O’Rourke did so capably in his Senate run against Ted Cruz in Texas last year. In what will be a terribly crowded field, candidates will need plenty of cash to get noticed. Ms Harris, a senator from California, can draw on many big donors on the West coast. It helps her, too, that the California primary is unusually early in the build-up to the 2020 contest. Fundraising in Indiana, in contrast, will be harder. 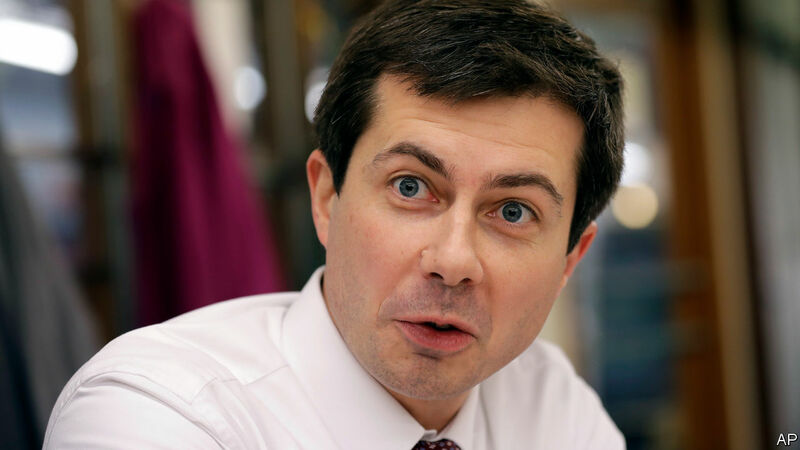 And whereas politicians who are former TV stars (such as Donald Trump), or rising social-media stars (such as Alexandria Ocasio-Cortez) can win free publicity, Mr Buttigieg is a softly-spoken, rather reasonable and uncontroversial sort of person. He does not threaten to set the world on fire. That is a good quality in a president—but it looks less helpful for a candidate.